For Halloween 2015 I was supposed to be a bridesmaid in a friend’s wedding. My husband was to be a groomsman and my son was supposed to be ring bearer. 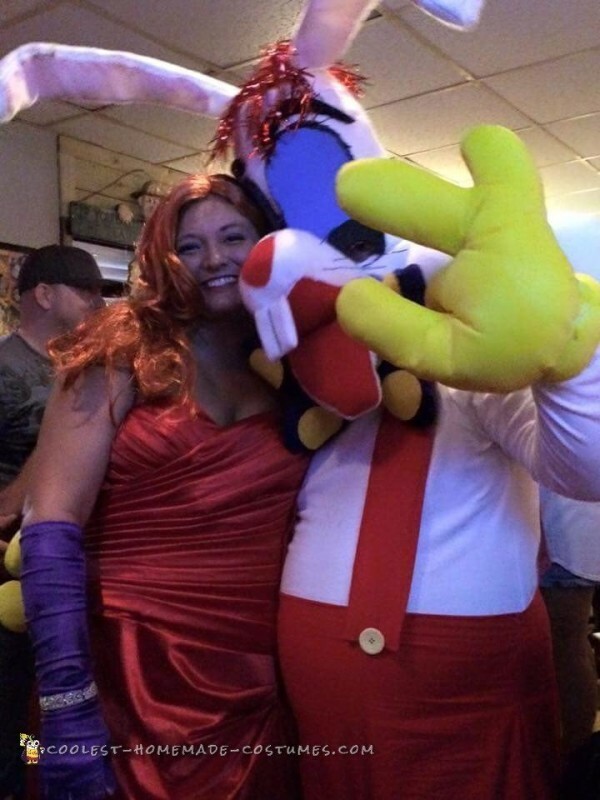 The wedding was called off on Tuesday prior to the Saturday night Halloween. Now we had a dilemma…what to do with the strapless red satin dress I had already purchased and had altered? The tuxes were easy, they just got cancelled from the rental company. 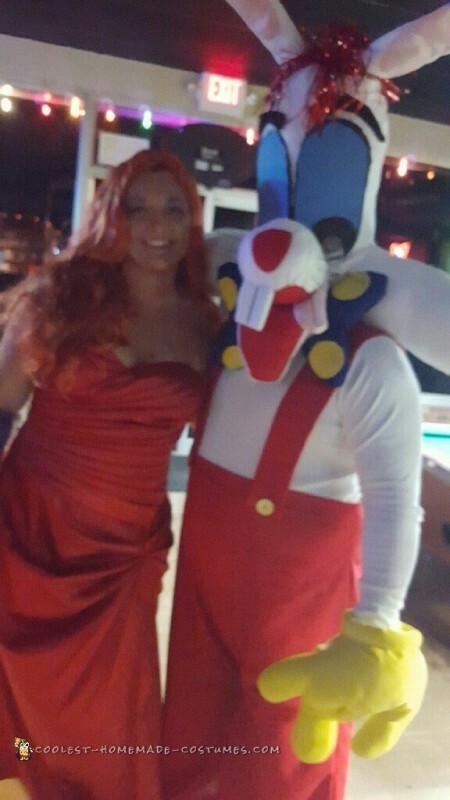 We spent Tuesday night looking at various ideas for a costume that included a red dress and eventually settled on Roger and Jessica Rabbit. It would include little on my part. Just cut a slit in the dress and hem it, buy a red wig and purple gloves. I couldn’t find purple so I bought white and dyed them purple. But now to make a Roger costume for my husband! We found a DIY on instructables.com that was helpful, but didn’t have all of the measurements and steps, so I had to get creative. I made the head and feet out of white fleece, mostly because that was on sale at the fabric shop! 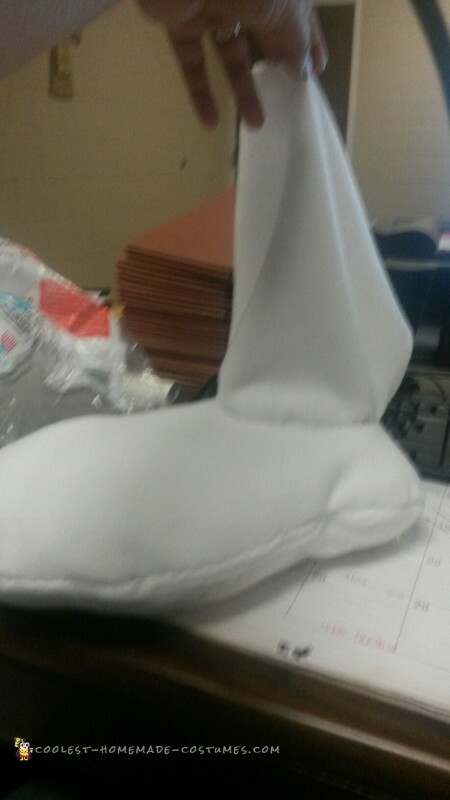 I cut out the basic shape of the head and stitched the outside. Then we used a foam half circle to ensure that the top would remain round. I created the ears out of the fleece and a pink nylon material, using wire coat hanger and a small amount of poly-fil to keep their shape. I poked the hooks through the foam and used lots of super glue to help them stay up. I stuffed the top with lots of poly fill, including around the foam piece so that the head was soft when people touched it. I then super glued fleece along the inside where it would be ouching my husband’s head. That way the filling stayed up and wasn’t itchy, but there was no seam along the face. I did the same with the cheek pieces, minus the foam. I did have to use another coat hanger in a “u” type of shape in the cheeks and up into the head to ensure that the cheeks stayed up. I sewed this in the angles of the cheeks to keep it off my husband’s face and shoulders. For the eyes I purchased clear plastic sheets from the craft store. The original costume idea had used blue tinted headlight covers the guy had recovered from his shop. Then I painted the sheets with stained glass paint. It was OK, but not exactly the look I was going for. So I used blue and black foam board pieces and made the eyes instead. I cut out a clear portion of the pupil for my husband to see through. Originally I left this clear plastic, but as he tried it on it fogged up so I ended up cutting it out entirely so that he could see. I used puff paint to seal the edges of the eyes and felt to make eyebrows. For the nose I cut out the shape I wanted and stuffed it with poly-fill again. I used a foam craft ball in the nose to have something to poke the wire whiskers into. I used a scrap of red for the triangle nose shape and sewed red on the bottom to create the roof of the mouth. Don’t forget to add bunny teeth! I used white felt with some of the foam board in the center. Then I used black embroidery thread to make the line to separate the teeth. I did basically the same thing to create the bottom jaw, adding in the pink tongue. I cut a slit in the head and sewed both pieces in, leaving a space in the center where I hot glued in a piece of PVC for a mouth hole. My husband used a straw to drink for a while. We purchased a white turtle neck and I made the bow tie. For the bow tie I just used felt and stuffed with poly-fil again. I made a strip of felt and used velcro at the back of the neck to fasten. We purchased the big cartoon hands but had to use a spray dye to paint them yellow. For the feet I took an old pair of tennis shoes and enclosed them in oversized white felt with a pink cut out in the bottom. 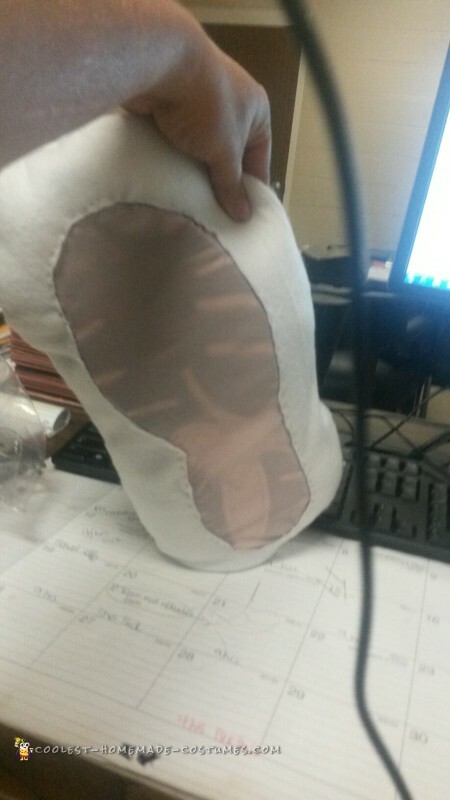 I stuffed with Poly and then made a “sleeve” to go up the leg like spats. I left on oversized hem allowance inside and stuffed that around the shoe to keep the poly inside. We fastened the top of the spats with velcro closures. I did use black embroidery thread to make toe separations in the end of the feet. Then I created the overalls. I used a light cotton fabric because we live in Texas and the rest of the costume was hot enough! I had them fit at the top and flare out to a wide bell at the bottom. I did put a zipper in the crotch so the pants would be more functional. I used the same craft/jewelry wire I used for the whiskers in the hem of the pants legs to make the bottom of the pants swing in and out in a zany way. For the suspenders I wrapped the red fabric around some of the white fleece to give them that puffy cartoon feel. Then I used the largest yellow buttons I could find to close them in the front. Don’t forget to add a patch of blue to the rear end with a bunny tail like Roger’s! I put this together in just 3 days working only in the evenings after work and most of the day Saturday. It was a lot of fun, but I probably would do some things differently if given the chance to do it over with more time. I overstuffed the nose/jaw so the hole wasn’t as functional as it should have been, plus my husband poked someone with the wire whiskers so a better material there would be helpful. I didn’t know about this contest until after Halloween so I didn’t take step by step photos, but I do have photos of the feet. If you are interested I can give you more details about it. Unfortunately none of our friends took a full length photo! We won our local costume contest, hands down though!